Sissonville guard Andrew Burdette is surrounded by Point Pleasant defenders Hunter Bush, Jordan Daubenmire (12), Aidan Sang and Kyelar Morrow (2) during the second half of Tuesday night’s boys basketball contest at The Dungeon in Point Pleasant, W.Va.
POINT PLEASANT, W.Va. — They practically had it all the way. Visiting Sissonville erased a 20-point deficit and secured its first lead of the night with 13 seconds remaining, but Braydn Canterbury converted a layup with five seconds left in regulation as the Point Pleasant boys basketball team held on a for a thrilling 70-69 victory Tuesday night in a non-conference matchup at The Dungeon in Mason County. The host Big Blacks (5-13) picked up their third win in four outings, but the outcome seemed like a foregone conclusion headed into the finale. After building a 20-point cushion midway through the third frame, the Indians (3-14) starting fighting their way back into the game as SHS trimmed its deficit down to 53-38 entering the fourth. The guests, however, received 16 points from Watson Mosteller as part of a 30-15 surge down the stretch run that included an old-fashioned 3-pointer that resulted in a 69-68 edge with 13 ticks remaining. 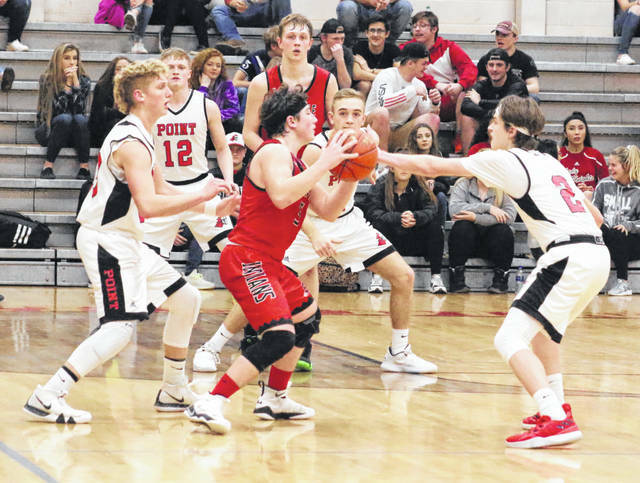 Point Pleasant followed by breaking full-court pressure as Hunter Bush and Braxton Yates worked the ball to mid-court, then Yates found Canterbury wide open underneath the basket. Canterbury collected the pass on the right side of the rim and calmly laid the ball off the backboard and in — giving PPHS a one-point cushion with five second left. Sissonville’s ensuing inbounds pass was stolen away by Bush, who then dribbled out the clock while preserving the slimmest margin of victory. Bush tallied 10 first quarter points while helping the Red and Black establish an 18-11 advantage, then both teams tacked on nine points in the second frame for a 27-20 contest at the break. Bush piled up 11 points and Kyelar Morrow hit three trifectas as part of a substantial 26-18 third period surge that gave the hosts 53-38 lead entering the fourth. The Big Blacks made 25 total field goals — including 11 3-pointers — and also went 9-of-15 at the free throw line for 60 percent. Bush paced the hosts with 32 points, followed by Morrow with 17 points. Damon Thompson and Evan Cobb were next with six markers each, while Yates contributed four points. Canterbury and Jovone Johnson both chipped in two points, while Jordan Daubenmire completed the winning tally with a single point. Sissonville netted 25 total field goals — including four trifectas — and also went 15-of-22 at the charity stripe for 68 percent. Mosteller led SHS with a game-high 33 points, followed by Will Hackney with 16 markers. Dylan Griffith and Brody Danberry were next with eight points apiece, while Chance Jones and Wyatt Ervin completed the respective scoring with three points and one point. The Indians have now dropped nine consecutive decisions. Point Pleasant hosted Buffalo on Wednesday and returns to action Friday when it travels to Mason for a non-conference matchup with Wahama at 6 p.m.